We’re not going to post a link that that hateful song* here, but it does make for a suitably tenuous title. This is a ZIL 4327 trial truck, designed to go anywhere. Truck trial motorsport is similar to motorcycle trials riding, in that a motorised vehicle must get as far along a fiendishly difficult obstacle course as possible with the fewest faults. Only in truck trial the competitors are trying to do it in a vehicle that weighs tons. Lego truck trial miniaturises this unusual form of motorsport and sends its tiny competitors out into the forests of Europe armed only with a remote control and a battery pack. You could do worse than follow this bright yellow ZIL 4327 by ArsMan064 though, which like its full-size counterparts can go almost anywhere the road ends. Drive comes from an XL Motor whilst three Medium Motors power the steering, winch and two-speed gearbox. With all-wheel-drive and huge ground clearance thanks to its long-travel suspension ArsMan’s ZIL is a wonderfully capable machine. Click the link above to follow the yellow bricks off-road (see what we did there!) via the Eurobricks forum. *Oh go on then. Click at your peril. We still haven’t gotten to the bottom of the Elves’ Russian obsession this past week. It continues with this; an enormous ZIL 110 Limousine, which is just like the American Packard Limousine design the Russians copied, only much, much worse. Tim Inman aka rabidnovaracer is the builder behind it. We open today’s blog with an overused cultural stereotype. Yay us! But only because the best off road vehicles by far all come from the Baltics/Eastern Europe. So too, do most of the best Truck Trial MOCs, but not this one. Thirdwigg is an American with access to a world map, making him quite a rarity, and his Russian ZIL 132 is almost as awesome off-road as the real deal. 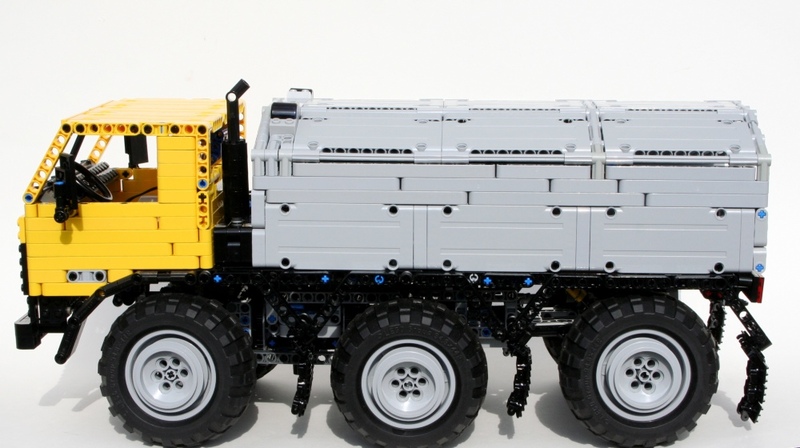 It’s powered by LEGO’s Power Functions motors, and features a remote control gearbox and 6 wheel drive. Check it out on his website or see it in action below.